Throughout the year we schedule themed events for the community to enjoy at our art studio and we ALWAYS have a blast! Any special studio event theme can also be selected as a paint theme for your own private event. Here's some quick tips about our special events. Themes - Couples Date Night, Ooh LaLa, Halloween Celebration and Black Light Paint Night are are just a few of our most popular studio events. 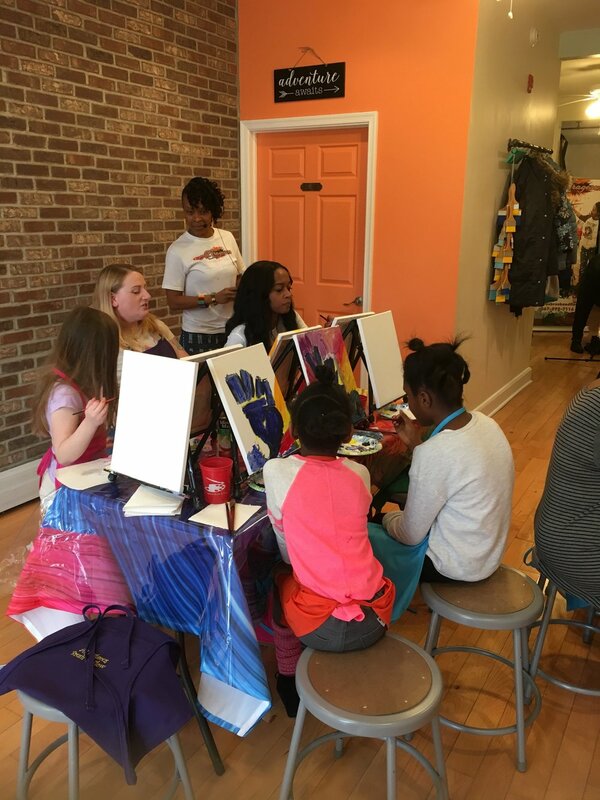 Most of our paint themes are family friendly, but also host a few Adult-Only events throughout the year. Registering For Our Events - Studio events are promoted on our website and through our social media. Ticket prices range from $20 - $40 and can be purchased online through Eventbrite. Reservations are not complete and guaranteed until payment is received in full. All classes begin promptly at the scheduled time. Studio Cancellations - All special events or classes are subject to cancellation. We will do our very best to notify guests well in advance. Paid guest will have the option to receive a full refund or to obtain studio credit for another event. Guest Cancellations & Refund policy - ALL REGISTRATIONS FOR SPECIAL STUDIO EVENTS ARE NON-REFUNDABLE. If cancelled in writing with 24 hrs notice, a studio credit will be issued. No refunds or studio credit will be issued for "no call - no show" guests. THERE ARE NO EXCEPTIONS TO THIS POLICY. Learn more about upcoming events and a few of our most popular studio event themes.